Strapless Heart Rate Monitors have greatly increased in popularity as the technology has improved. This is not only because they are proven to be ECG accurate, they are also easy to use, comfortable to wear and give you the freedom to check your heart rate at any time, not just during exercise. You see, a strapless heart rate monitor comes with a distinct advantage over a heart rate monitor requiring a chest strap – you guessed it, no strap. Both types of heart rate monitors have their advantages and the discussion below will hopefully help you in understanding the advantages of Strapless Heart Rate Monitors and therefore enable you to choose the right type of watch to help in your quest for health and fitness. A heart rate monitor with a strap works by having the strap transmitter around your chest. This strap has the sensor that picks up the electrical activity of your heart and sends the heart rate to the watch, via a radio signal, where it is displayed. Because the strap has constant contact with your chest wall this gives you a continuous measure of your heart rate, which is updated every 5-10 seconds. A strapless heart rate monitor works in a very similar way to a heart rate monitor with a strap. It uses a sensor which is, in this case, in the back plate of the watch and another sensor in the buttons or metal plate on the face of the watch. The electrical activity of the heart is detected through the sensor in the back of the watch worn on the wrist. Finger touch to the sensor on the face of the watch completes the electrical loop and allows the watch to display your heart rate in beats per minute. This advanced digital processing technology has been developed in Silicon Valley, California. For the heart rate monitor to work you simply press one or two finger’s down on the face of the watch and have the back plate on your wrist – your heart rate at the time will be displayed for the duration of time you hold your finger(s) to the sensor. If you kept your fingers on the watch the heart rate display is continuous which is useful in monitoring recovery rate after an exercise effort such as sprints. The main advantage of a Strapless Heart Rate Monitor is that it can be worn all day – after all, it’s just like a watch. 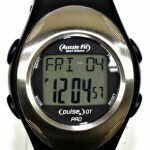 In fact it is a high performance sports watch with loads of fitness and health tools depending on the model you choose. You’ll find that one of the big rewards is being able to take your heart rate at random times during the day – it really gives you a good sense of your heart rate under normal and more stressful conditions. Heart rate monitors with straps tend to be worn only during exercise as the strap can be restrictive, uncomfortable and fairly noticeable under clothes. A heart rate monitor with a strap takes your heart rate continuously – thus providing data continuously on your display. This is great for activities such as bike riding when it is difficult and dangerous to hold the fingers of one hand onto the sensor of the watch. The Strapless Heart Rate Monitor is perfect for people who need to know their heart rate at any given time, and can be used for activities such as swimming, sprinting, walking, running or stationary bike riding where a heart rate rate is taken after a sprint, lap or during a walk or run. And depending on the model the amount of data available can tell you your highest and lowest heart rate and percentage of maximum heart rate. Another fantastic benefit of the Strapless Heart Rate Monitors is that they are usually significantly cheaper to initially purchase and also to have battery changes. Battery changes can be performed by most jewelers. All in all both types of monitors are great motivational tools helping you to set targets and keep focused on your goals. They both work well in providing accurate heart rate monitoring. The type of monitor you should get depends on the type of exercise you’re doing and what sort of information you need and your personal preference to wearing a strap transmitter or not.